Select Size 24"x 16"x 15.5" 27"x 19"x 20" 37"x 23"x 25.5" 36"x 25"x 27"
This group of Skudo Travel Carriers give your dog, cat, or small mammal a safe and cozy place to retreat. 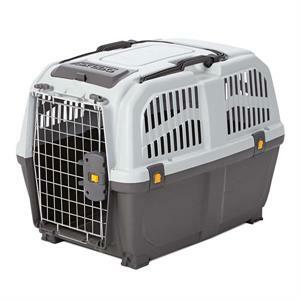 It is a product of Midwest Homes for Pets and serves as a perfect carrier for travel. The small size has a handle on top. The larger sizes have a handle that can be used to pull the crate. 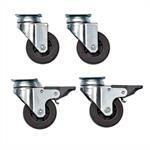 (Casters are extra) The large sizes also have a convenient compartment to put the dog leash in. 1424 SG-- 23.625"x 15.75"x 15.125"
1427 SG-- 26.75"x 18.75"x 20.125"
1432 SG-- 36.375"x 23.125"x 25.5"
1436 SG-- 36.25"x 24.875"x 27.25"
Casters for Skudo Travel Crates.